View south along the north Taranaki coast in the vicinity of Tongaporutu river mouth, showing magnificently exposed deep-water sand-rich strata of the Mount Messenger Formation, laterally equivalent deposits to producing petroleum reservoirs in subsurface Taranaki Peninsula. Source: Lloyd Homer/GNS Science New Zealand has produced petroleum for nearly 100 years since oil first flowed from the Moturoa field in Taranaki Basin. Discovery of the Kapuni gas field in 1959, the giant Maui gas field in 1969 and the McKee oil field in 1979 cemented Taranaki as the focus of exploration. The discovery and development of the Pohokura and Kupe gas fields and the Tui and Maari oil fields followed within the last decade. A total of around 2 Bboe has been discovered in Taranaki, and petroleum is New Zealand’s fourth highest export earner. 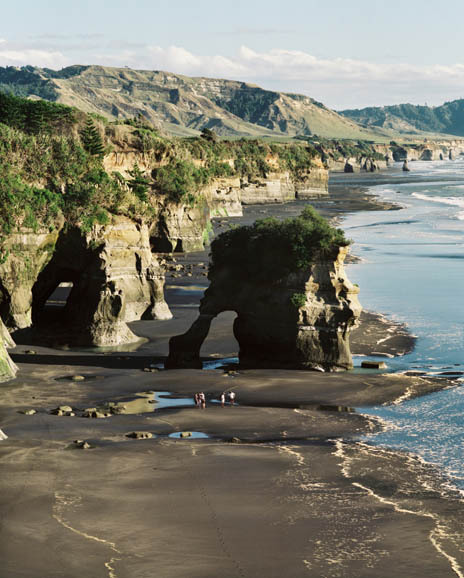 Production is so far limited to only a small fraction of the 1.5 million square kilometres of sedimentary basins that underlie New Zealand’s territory. Oil and gas exploration of onshore and nearshore areas away from Taranaki has been sporadic, but at least three basins, the East Coast, Canterbury and Great South, have been shown to contain effective petroleum systems . Rises in the price of oil and the growing awareness of the extent of sedimentary basins within New Zealand's territory have increased industry interest in frontier areas, all of which are relatively unexplored and in many cases undrilled. Attention is now being paid to deepwater Taranaki, offshore Canterbury, Great South Basin, onshore east coast of the North Island, and the Raukumara Basin. At least some of this activity is the result of reconnaissance seismic surveys in five frontier basins conducted by the Crown Minerals division of the Ministry of Economic Development. Neogene anticlines in the East Coast Basin are bounded to the south-east by thrust faults and impound piggy-back basins with turbidite basin-fill. Amplitude anomalies at the margins suggest gas migration and leakage. Source: GNS Science The islands of New Zealand are the emergent parts of an extensive, mainly submerged continental landmass; New Zealand territory covers almost 6 million km2, 20% of it underlain by sedimentary basins. Source: GNS Science More than 400 wells have been drilled in the onshore and shelf parts of the Taranaki Basin, covering about 100,000 km2 of the western North Island and adjacent area offshore. Taranaki initially formed as an Early Cretaceous to Paleogene intraplate rift basin, during fragmentation of the Gondwana continental margin. 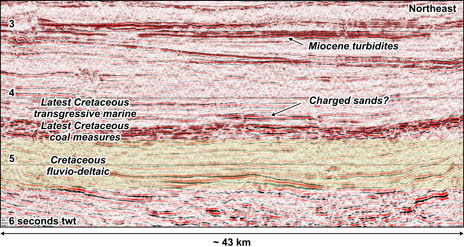 The basin was structurally overprinted in the Neogene as a result of the development of the modern convergent plate boundary through New Zealand. Some depocentres contain more than 9,000m of basin fill. Exploration targets include structures and stratigraphic traps formed by rift-related processes and compressional inversion structures. Source rocks known to have generated hydrocarbons in commercial quantities are mainly Late Cretaceous and Paleogene coal-bearing rocks and marine shales but, in two areas, geochemistry indicates a mid Cretaceous or older source. Proven reservoirs include Paleocene and Eocene terrestrial, paralic and near-shore sandstones, Late Eocene to Pliocene turbidites, fractured Oligocene limestone, Miocene volcaniclastics, and Pliocene shelf sands. In global terms, the basin is considered a far-from-mature province. The recent discovery of the large Pohukura gas field (2000), the discovery of oil in a new play in Tui (2003), with a world record production payback time of only 3 months, and the likely upgrading of the size of the gas resource at Mangahewa, are just a few of the indications that the basin may yet hold surprises. Some of the current challenges and opportunities for exploration include evaluation of reservoir quality for tight gas plays, improvement of seismic imaging in areas covered by volcaniclastics, unravelling migration pathways from petroleum kitchens, and exploration of Cretaceous deep reservoir potential. The East Coast Basin covers about 130,000 km2 of the east coast of North Island and the adjacent Hikurangi margin. Over 300 oil and gas seeps, both onshore and offshore, have spurred exploration interest since the late nineteenth century. More than 40 wells have been drilled onshore, including a sub-commercial dry gas discovery. Only three wells have been drilled in the extensive offshore region and all had good gas shows. The oil and gas seeps are testimony to the area’s source and migration potential; the challenge is to find good quality reservoirs. 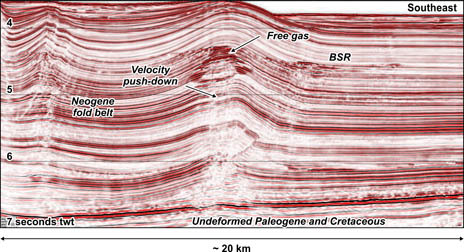 Most wells have targeted compressional anticlinal traps formed inboard of the modern plate margin. Recent research suggests that exploration may have to be turned on its head; it appears that turbidite sands are likely to be better developed along synclinal axes than across anticlinal crests. En-echelon large-scale thrust ridges formed by syn-depositional tectonics along the Neogene convergent margin are inferred to have formed barriers to down-slope sediment transport, with intervening piggy-back basins instead acting as conduits for coarse-grained turbidite flows. Good quality reservoirs may be preferentially developed in synclines, and traps may be developed either stratigraphically by lateral facies change or structurally by basin inversion. Seismic amplitude anomalies and interpreted gas chimneys on the flanks of these basins support their consideration as exploration targets. This play was unknowingly explored by the historic Waingaromia-1 well, spudded in 1884. Rain prevented transport of the rig to the planned drill site on top of a hill near an oil seep. The hole was drilled in the valley instead and found oil at about 300m. The well produced 20 to 50 bopd until associated gas caught fire and destroyed the rig. Modern work has shown that Waingaromia-1 was drilled into a stratigraphic trap within a syncline. The little-known Pegasus Basin due east of Wellington was mapped for the first time in 2010. Seismic surveys show direct hydrocarbon indicators associated with large, gentle folds; in places a bottom-simulating reflector inferred to represent gas hydrates forms a seal. Source: GNS Science Thick, little-deformed Cretaceous and Paleogene rocks of the Raukumara Basin were deposited in a passive margin setting. Early Miocene convergence resulted in emplacement of thrust sheets, yet the overall structure of the basin remains remarkably simple. 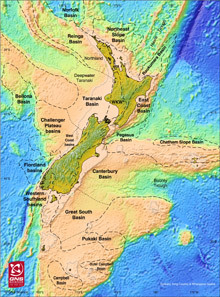 Source: GNS Science The deepwater Raukumara Basin lies north of the East Coast Basin and west of deformed rocks associated with the modern plate boundary. Pegasus Basin, north of the Chatham Rise and east of the East Coast Basin, lies entirely on the Pacific plate. Neither basin has been greatly affected by Neogene tectonics along the plate boundary. They have not seen any drilling activity, but seismic amplitude anomalies are strong indicators that both basins have active petroleum systems. Raukumara Basin initially formed as a passive sedimentary wedge across the fossil Gondwana subduction margin. In the Early Miocene its eastern margin was uplifted, folding the basin into a large syncline. In-place Cretaceous and Paleogene rocks are overlain by thrust sheets emplaced in the Early Miocene. Younger Neogene turbidite successions flowed along the axis of this basin. Crown Minerals collected seismic data across much of the basin in 2007 and in 2010 Petrobras was awarded an exploration permit over an area of 12,330 km2. Recently, the first reconnaissance 2D seismic survey across the Pegasus Basin revealed more than 10,000m of sedimentary fill, with more than 6,000 m deposited in the Neogene. This basin originated along the Gondwana subduction margin and contains a fossilised subduction system separated by 100 km and 100 million years from the present-day subduction margin. Large structures have been mapped and there are direct hydrocarbon indicators throughout the basin. The Carrack and Caravel prospects of the Canterbury Basin comprise Late Cretaceous sands draped over structural highs, with mature, older Cretaceous source rocks present in an adjacent kitchen area. Source: GNS Science Canterbury Basin covers at least 360,000 km2 east of the South Island, extending from the foothills of the Southern Alps to the Bounty Trough offshore. Eight onshore and five offshore wells have been drilled. Galleon-1, a sub-commercial gas discovery, produced 10 MMcfgpd and 2,300 cfpd of condensate, while Cutter-1 discovered a 56m gross hydrocarbon column in poor quality sandstones. Several companies have interests in exploration permits, including Anadarko, Origin Energy, AWE and NZOG. Late Cretaceous and Paleogene geology and tectonic history are similar to those of Taranaki Basin. Canterbury Basin has up to 6,000m of Cretaceous to Recent basin-fill, thickest in Cretaceous rift basins. The most widespread source rocks are Late Cretaceous to Paleocene alluvial to coastal plain coaly rocks, but biomarker and isotope geochemistry of oil shows from the wells indicate that mid-Cretaceous paralic coaly rocks in syn-rift depocentres may be most petroleum-generative. The most promising reservoir rocks are terrestrial sandstones of the Cretaceous syn-rift succession, and Late Cretaceous to Miocene fluvial, estuarine, shallow marine and deep-water sandstones and limestones. In the deeper continental slope waters, Anadarko and Origin have committed to drill the giant Carrack-Caravel prospect. The prospect lies within the petroleum kitchen that sourced the Galleon discovery. 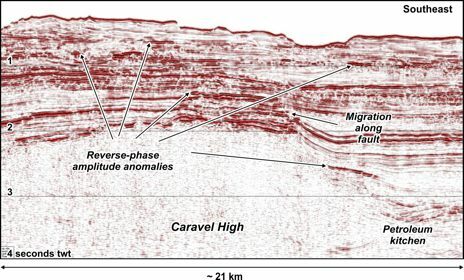 At basement level, Carrack and Caravel are two separate culminations on a large closure; Caravel to the north encloses 58 - 78 km2 at top Cretaceous level, and Carrack encloses 200-220 km2. Both structures exhibit strong AVO anomalies. 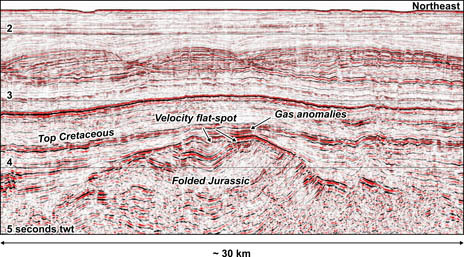 Extensive fields of pock marks at the head of the deep-water Bounty Trough, as seen on the sea floor on swath bathymetry and within shallow sediment horizons on 3D seismic data, could indicate an underlying active petroleum system. Great South Basin syn-rift and post-rift sediments are draped over structural highs, some formed of open folded Triassic-Jurassic marine and non-marine sandstones and mudstones. Source: GNS Science The Great South Basin is a large Cretaceous, and possibly older, rift basin to the south of the Canterbury Basin. It lies almost entirely offshore in water depths averaging 750m. It was first explored by Hunt International Petroleum Company, and eight wells were drilled from 1974 to 1984. Four had oil and gas shows and one, Kawau-1A, was a sub-commercial gas-condensate discovery with an estimated 461 Bcfg. Source rocks are coal-bearing Cretaceous units, with significant oil potential. The Kawau reservoir is Late Cretaceous transgressive sandstone and recent work suggests that Late Cretaceous and Paleogene turbidites sands may also be present. OMV, PTTEP and Mitsui are partners in three permits, and Greymouth Petroleum has another. The OMV joint venture acquired more than 20,000 km of 2D seismic data and reprocessed older data. Exxon Mobil has recently relinquished acreage in the basin, after evidently targeting a specific play type, but leaves a legacy of newly-acquired high-quality seismic 2D and 3D data that is now open file. Numerous large prospects are present in the basin. The Greymouth permit lies across the basin margin where plays may include pinch-out traps. Mount Taranaki, a dormant andesite volcano 2,518 m high, towers over the Taranaki peninsula, home to New Zealand's producing oil and gas fields, some of which lie between the volcano and the coastline seen in the distance. Photo: Lloyd Homer, GNS Science In eastern Taranaki Basin close to the shelf edge, wells have shown basement to be overlain by Late Cretaceous coal measures. In the deepwater province, however, the coal measures are underlain by a thick deltaic unit of older basin-fill rocks. Source: GNS Science North-west of the Taranaki shelf edge is the deepwater extension of the basin. Anadarko, Hyundai HYSCO, AWE, Global Resource Holdings and RCT hold a permit over 32,830 km2 of the basin. There has been no drilling in the deepwater Taranaki Basin but seismic line ties to wells near the shelf edge allow extrapolation of the Late Cretaceous to Neogene stratigraphy into the basin. In the deepwater province an additional, extensive, thick deltaic succession is interpreted to underlie Late Cretaceous coal measures drilled closer to shore. The delta overlies a rift basin interpreted to be Jurassic and Early Cretaceous in age. North-west trending Mesozoic rift structures and orthogonal Cretaceous and Paleogene rifts associated with fragmentation of Gondwana form large basement highs, across which reservoir facies are draped. Potential reservoirs are of Cretaceous to Neogene age, with Miocene channels and turbidites particularly attractive. Some of the play types are correlatives of fairways in the nearshore part of the basin, but others are unique to the deepwater province. The Late Cretaceous coal-bearing units that are present across the top of the deepwater delta sourced the oil and gas in the Tui, Maui, and Maari fields. The present-day oil expulsion window is modelled to include the base of the coaly facies and much of the underlying delta. Beyond the delta front the succession may include pro-delta turbidites that could have carried kerogen into deep water, similar to the Kutei and Sabah basins of Indonesia where hydrodynamic sorting aided preferential transport and deposition of oil-prone leafy kerogen. Seismic amplitude anomalies are strong indicators of an active petroleum system. New Zealand’s territory covers almost 6 million km2, including about 1.5 million km2 of prospective sedimentary basins. Taranaki remains the reference point for exploration, as it is the best known basin, but even it has proved to hold surprises. Many basins originated along the active Mesozoic Gondwana margin. In some areas, Jurassic Murihiku rocks, formerly considered as basement, may be part of the basin fill and have source potential. Rift basins formed throughout much of the region during the breakup of Gondwana in the Cretaceous. After a long period dominated by intraplate rifting and subsidence in a passive margin setting, initiation of the modern plate boundary through New Zealand began in the mid Eocene. North West New Zealand was affected by a major compressional event in late Paleogene time, while in the south there was rifting. Major Oligocene crustal downwarps are also recorded. The modern plate boundary propagated through the region in Early Miocene time. Development of a regional tectonic and paleogeographic framework allows extrapolation of basin architecture and inference of petroleum systems development beyond Taranaki. Research on Taranaki reservoirs provides insights into the controls on reservoir distribution and secondary processes affecting porosity and permeability, with implications for similar depositional systems in other basins. Structural and plate motion history give insights on source rock distribution, reservoir provenance, burial history, regional heat flow, and the timing of hydrocarbon generation and structural trap formation. Widespread understanding that New Zealand is a submerged continent with vast sedimentary basins has been a long time coming, but will undoubtedly shape thinking about the country’s petroleum prospectivity in the future. Given the nature, extent and geological history of the basins, it is unlikely that the only commercial accumulations of oil and gas in New Zealand are in nearshore and onshore Taranaki. Exploration efforts in New Zealand’s frontier basins may be rewarded by discoveries of significant petroleum resources. GNS Science is New Zealand's premier provider of natural resources research and consultancy services. Open-file data and reports are available on the Crown Minerals website: (http://www.crownminerals.govt.nz/cms/petroleum/technical-data). The use of geophysical methods in petroleum exploration continues to expand and is an integral discipline in the discovery and production of oil and gas deposits. An Exploration and Production organisation generates vast amounts of data in order to define and value its subsurface assets. But ultimate value will only be maximised if critical business decisions are made correctly, based upon the knowledge and understanding that data can provide.